Thanks for sharing and I am so encouraged by the fact that you are sharing these messages with superintendents and senior administration. Thank you! I use the Conversation Prism as well. It’s brillant. It is about those nonnegotiables of being a connected leader, using many tools, being open, practicing and ultimately, learn first and lead second. This looks like a great presentation, but I’m wondering if there will be an audio, video or podcast of the actual presentation that you give? I’d like to share with my district leadership, but I’m afraid the slides alone will limit the impact of the material. Thanks for sharing! Unfortunately they are not doing any video / audio coverage of this presentation. I am giving similar presentations coming up, so hopefully at some point there will be video to accompany the slides. I agree that the slides are really a small part of the story. Please feel free to use the slides as you see appropriate. From the Slideshare site you can download the slides in their original format and you are welcome to customize them for your needs. I have been following your work for a while now, and I appreciate so much the leadership you demonstrate. 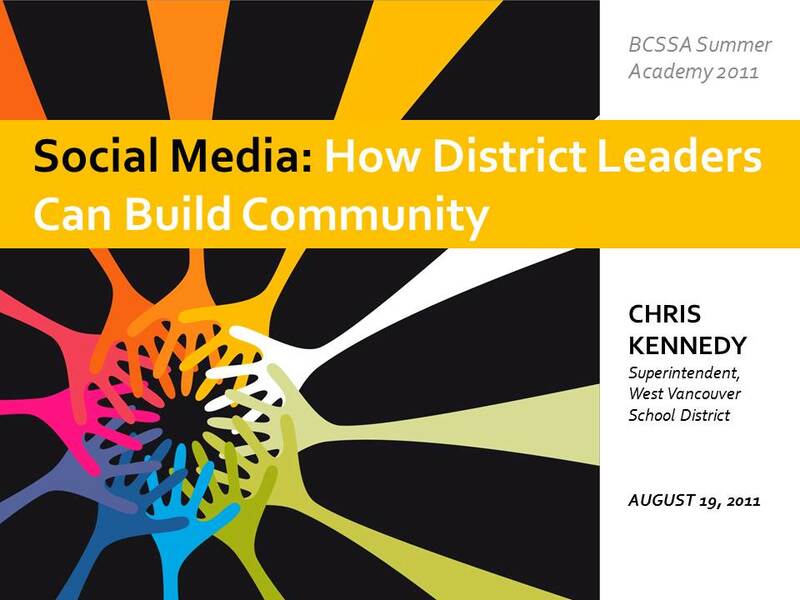 Your position on social media as an integral part of educational leadership is bang on. I think it is fascinating that some leaders in our profession shy away from social media because, as you say “there are always risks as we expose ourselves more publicly”; while I understand their concerns, it seems to me that by choosing to work in education, we are choosing to be exposed to (potential) public scrutiny all the time. To fear it in the social media context seems unnecessary. I recognize the risks, but the opportunity to learn from the leaders in my field far outweighs them, in my view. Thank you for being one of those leaders. Thanks Karen for the kind words. I feel so supported in the digital space. I liked the presentation there Mr. Kennedy, just a quick question for you though. Do you feel that one should develop a personal web presence that dabbles in your professional life or should one create a professional presence that dabbles in your personal. Or… Should these be two completely separate entities? This is something I think about a lot. I have tried to separate the tools – to professional tools and personal tools. For me, my blog and Twitter are almost exclusively professional. I sometimes share a little bit of my personal life – to humanize me and my work but I really see them as professional tools. Facebook is a personal tool. I am connected, largely to very different people on Twitter than I am on Facebook. I think trying to manage multiple accounts is really challenging. I am interested in Google + because it seems easier to manage personal and professional networks in one place. I was speaking about this to our school administrators this morning, and I think it is always a good reminder that just as we are teachers in the grocery store or at the soccer field, we are educators everywhere we are in the digital space. I for one cannot wait for Google +… I have been trying to score an invite all summer long but to no avail. For me, my personal horse has already left the barn. My @oldschoolparent twitter handle and Parenting Old School blog, has crossed over from my personal online life and is part of my professional presence as well. Whether this is a good thing or not only time will tell. The only draw back I have experienced so far is that on a rare occasion, I will be challenged by colleagues on my blog posts. Then again, I enjoy stirring the pot so it is all good.